Safety Speed Manufacturing has rolled out a certified technician program beginning with its flagship vertical panel saw line. The first graduates – representatives of DOC Maintenance and Compact Power Services – successfully completed the two-day certified training program in November. The certified technician program begins with a tour of Safety Speed’s office, factory and showroom in Ham Lake, MN, where trainees are exposed to the company’s full product line: vertical panel saws, vertical routers, saw/router combinations, widebelt sanders, edgebanders and screw pocket machines. 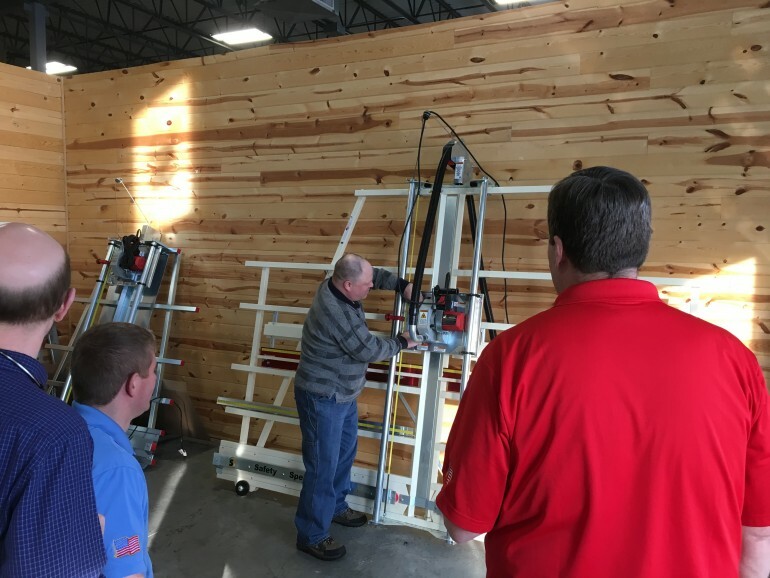 Following the tour and overview, the participants receive hands-on training on the 6400 and 7000 series of vertical panel saws, both manufactured at the Ham Lake facility. The training includes a thorough review of each model’s key components and operations including Skil motor type, UL certification, guide tubes and counter weight system. From there, participants learn best practices for installing a saw, including replacing an existing one, types of switches used, dust collection connection and alignment procedures with special attention to motor, riving knife and turntable indexing. Maintenance performance and troubleshooting potential problems also are addressed, things like fixing motor noises, motor brushes and bent riving knives. Popular saw accessories, including the Midway fence and stop bar gauge, are covered. Each session concludes with the trainees operating the saw following recommended safety procedures. The next certified training session is scheduled for February 21 and 22 at Safety Speed’s facility in Ham Lake. To learn more about this or future training sessions, contact Jeff Chermack at j.chermack@safetyspeed.com.